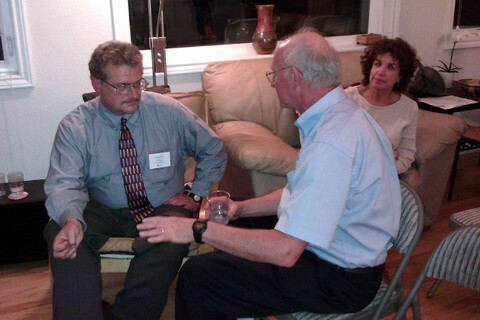 Charles Perkins, Senior Military Affairs & Defense Policy Analyst for the American Israel Public Affairs Committee (AIPAC), spoke to a group of Israel supporters at the Lafayette home of Kathryn Bernheimer and Stan Kreis Monday night. Perkins spoke mainly about the state of the special relationship between Israel and the United States, and debunked many of the myths circulating in the press and blogosphere that suggest that the relationship has somehow deteriorated during the Obama Administration. 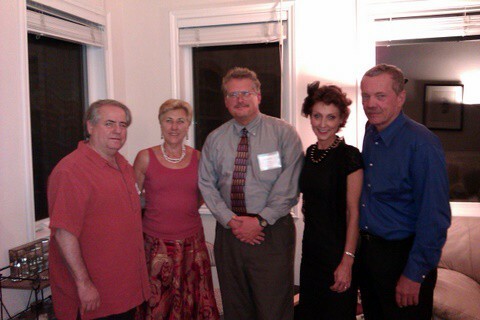 l-r Stan Kreis, Kathryn Bernheimer, Charlie Perkins, Jane Rubenstein and Ken Stickney. The meeting was co-hosted by Jane Rubenstein and Ken Stickney, longtime Boulder AIPAC supporters, and Perkins was accompanied to Boulder by Claire Schwartz and Callyn Weintraub of the Denver AIPAC office. Jeff Linsky, center, makes a point to Charlie Perkins, left, while Barbara Trager looks on. Charles Perkins is Senior Military Affairs & Defense Policy Analyst for the American Israel Public Affairs Committee (AIPAC), where he serves as part of the organization’s defense and strategic issues team. He is responsible for monitoring and analyzing Israel’s defense requirements, regional weapons proliferation, arms transfers, the U.S.-Israel strategic relationship, and other security developments in the Middle East, as well as related U.S. policy and legislative issues. He is the author of “Arms to the Arabs: The Arab Military Buildup Since 1973“, and his frequent articles on defense issues have appeared in Near East Report and other publications. Mr. Perkins is an authority on regional conflicts, military technology and arms proliferation. Prior to joining AIPAC in 1987, he worked on defense and strategic issues with several publishing and consulting organizations in the D.C. area, and completed graduate studies in international security policy at George Washington University. For more than half a century, the American Israel Public Affairs Committee has worked to help make Israel more secure by ensuring that American support remains strong. From a small pro-Israel public affairs boutique in the 1950’s, AIPAC has grown into a 100,000 member national grassroots movement described by The New York Times as “the most important organization affecting America’s relationship with Israel”. AIPAC is the only American organization of its kind whose principle mission is to lobby the U.S. government about legislation that affects the U.S.-Israel relationship. Whether it’s preventing the proliferation of terror and nuclear weapons in the Middle East, or ensuring American support for Israel’s security decisions, together we can continue to make a difference.